I am so pale, whether its summer or winter. Generally I just tend to live with it and promote myself as an ‘English Rose’ rather than attempting to tan and burning myself lobster red. 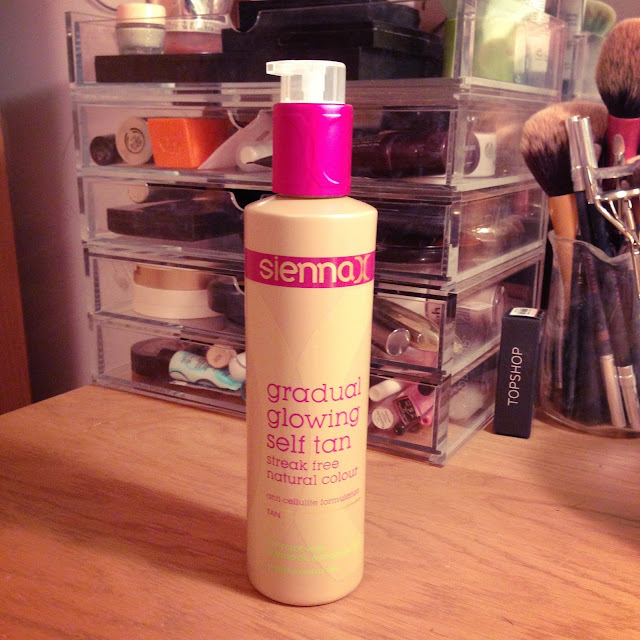 Now and again though I do like to try out some fake tanning products to give me a kiss of colour when I’m going out for the evening or its a celebration etc. 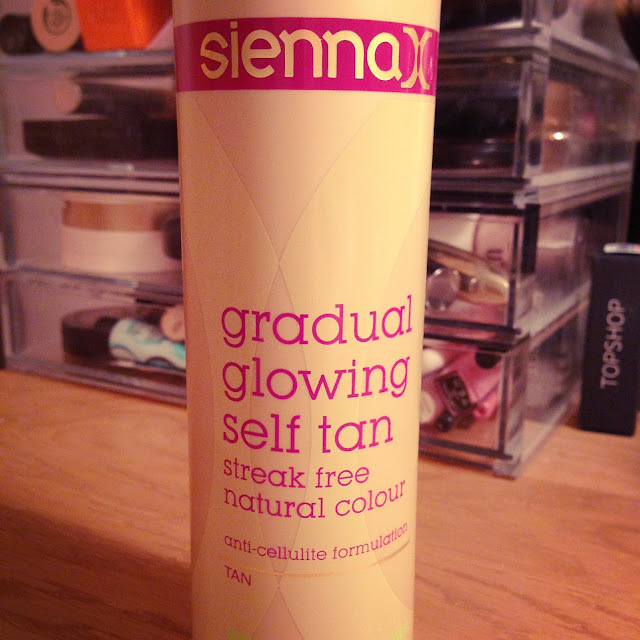 I bought this Sienna X gradual glowing self tan for this reason and applied it last week in the daytime for an evening drinking night. I applied it with my hands as it comes out as a white cream, so I wasn’t worried about ruining my hands. Plus, as there is no actual guide colour, I thought I might as well apply it with my hands rather than a mitt, because either way I’m not going to know where I had applied the product. Plus it is the best way to feel where my skin was tacky. I covered my arms in the product and left it to dry. It probably took around an hour to feel like it was almost dry, yet I left my dressing gown on anyway just in case. My biggest problem with the product is the smell, which was much more biscuity than I had hoped. I really thought that it wasn’t going to have a strong tanning scent, yet it did and my Bassett-hound nose kept smelling it every time I moved. However, getting past that it did leave my arms with a slight hint of colour, taking away the pale gleam and covering it in a glow. I think if I had continued to add another layer the day after, it would have deepened the colour and given me a really lovely shade so overall I am quite impressed. To be honest though, due to the price tag and the fact that I was hoping for something a bit more special, I don’t think Ill be repurchasing this. It is almost identical to my usual favourite, the Ambre Solaire After Sun tan maintainer and that is about a third of the price. I will continue my quest for an unscented, natural glowing tan in a bottle. Are there any you could recommend me?